By 1888, the year before Montana achieved statehood, more than 50 millionaires were living in Helena — more millionaires per capita than any other city in the world. Evidence of that astounding wealth still abounds in the city today, particularly in the grand homes in the Mansion District as well as at the bed and breakfast where I chose to stay for a few days. Enjoy a bitter cold Montana night before the cozy fireplace. Built in 1875 by Wilbur Sanders, a lawyer and one of the first two senators from the new state of Montana, and his wife, Harriet, the three-story mansion, plus attic, occupies a corner lot, surrounded by trees that provide plenty of shade. When the current proprietors purchased it and opened it as The Sanders B&B in 1987, they became only the third owners of the home in over a century and the proud bonifaces of Helena’s first B&B. They’ve taken very fine care of it ever since. The Sanders family’s presence remains evident in today’s B&B. Their rock and mineral collection is displayed in the entryway, and one of Harriet’s oil paintings still hangs in the sitting room. 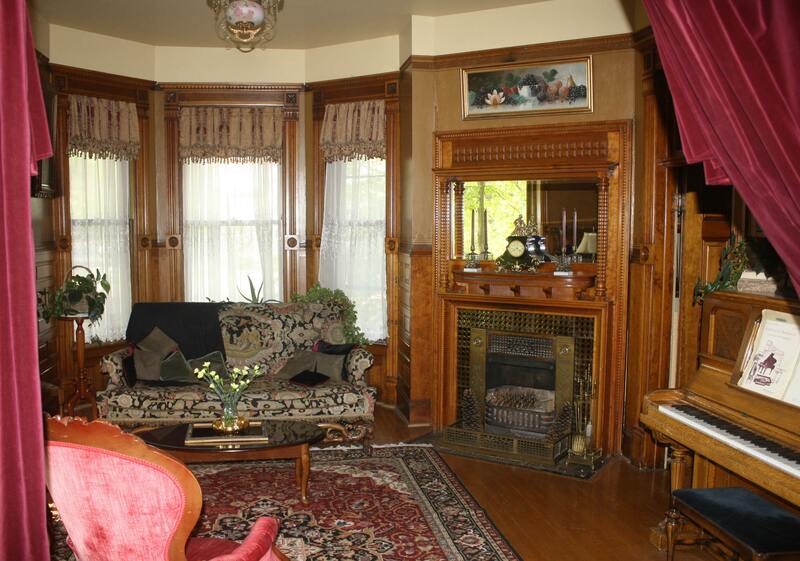 The common areas on the first floor entice you to relax by poring through the stacks of reading materials in front of a fireplace with a mirrored overmantle surrounded by beautiful woodwork, or creating some music at one of the two pianos. Each of the seven guestrooms combines turn-of-the-(20th)-century elegance and modern amenities. My room, The Colonel’s, featured a finely carved, gloriously comfortable queen-size sleigh bed, just one of the furnishings originally owned by Mr. and Mrs. Sanders, and an agreeable view of the neighborhood. In the morning, before you take to the streets, perhaps to one of the top five historic districts in the United States or to the gorgeous Cathedral of St. Helena, join the other guests in the wainscoted dining room over a filling breakfast of orange juice, fresh fruit, and, on any given day, gingerbread waffles, a sausage and cheese omelet, or pancakes and bacon. 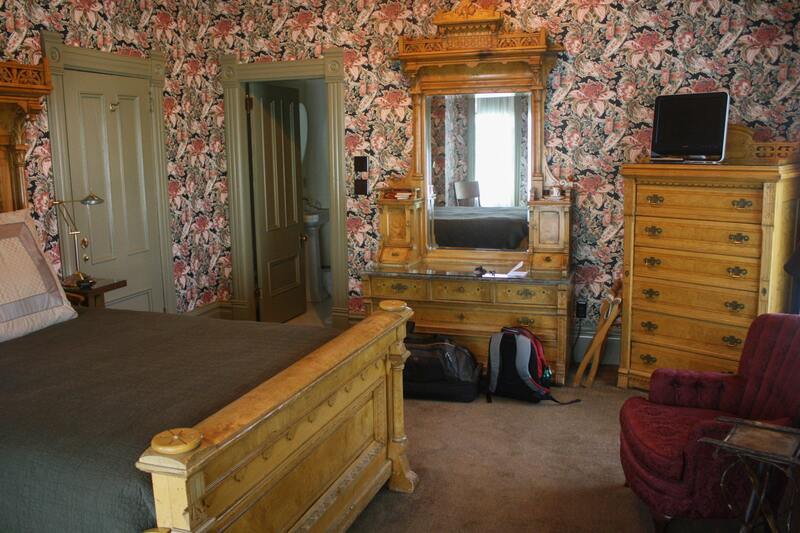 Original furnishings and an exceptionally comfortable bed await you in The Colonel’s Room. When you return for a little respite in the late afternoon or early evening, the B&B’s wraparound porch supported by nearly a dozen columns offers a fine, restful spot to chat with owner Bobbi Uecker, a former lawyer. “Everyone in Helena seems to know one another,” she said in her cordial manner as we spied a deer munching on the neighbors’ plants. I nodded in agreement as I sampled the homemade cookies and the refreshingly tart lemonade that Bobbi offered me as she joined me on the porch. I had witnessed multiple instances of this widespread familiarity around town that day. “But it’s nice to get away once in a while, too,” she conceded, adding that her husband, Rock Ringling (great-grandson of one of the famed circus family brothers), escapes to New York every year or so for fundraising and stays at a friend’s place exactly three blocks from my home in Brooklyn. Perhaps everyone in Helena knows everyone outside Helena, too.